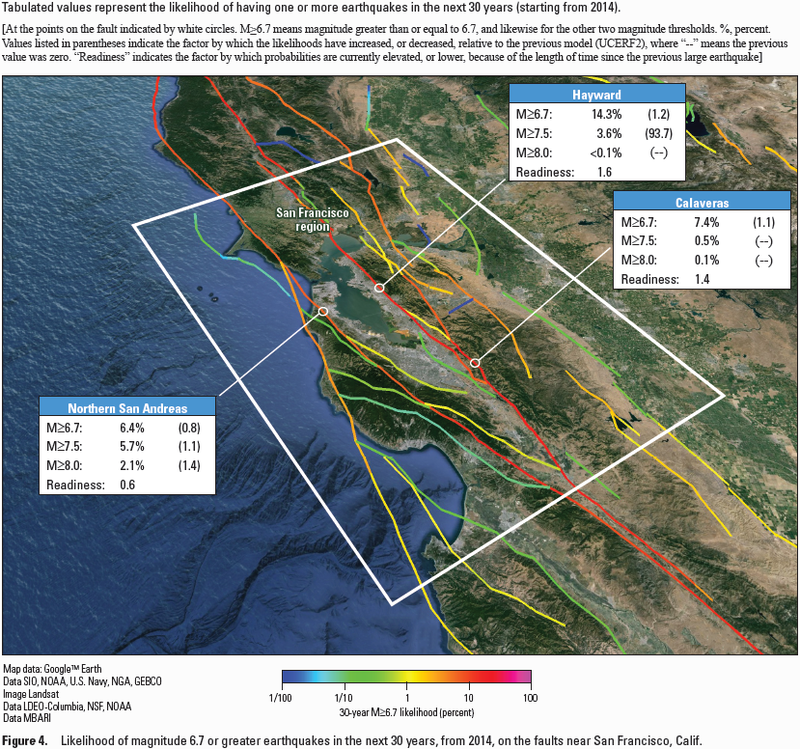 The U.S. Geological Survey issued a major update to its statewide earthquake forecast yesterday, the Third Uniform California Earthquake Rupture Forecast (UCERF3). No surprise, the news media boiled it down a little too far for my taste. For our side of the bay, there wasn’t a lot of change in my mind. Click the image below for a larger and wider image showing the whole Bay area. The whole report is online. The Hayward fault is now officially considered to have a much higher risk of a very large, magnitude 7.5 or so, earthquake. (The figure in parentheses shows the percentage of the change in assigned risk.) This is because now we’ve added the possibility that not only the whole fault, but its neighboring faults (Rodgers Creek on the north and Calaveras on the south) could join it in an oversize rupture. Scientists (and I) have known about this change for a while because we follow the literature, but the new forecast is a formal admission. The people who will study this in detail are doing things like setting earthquake insurance rates and designing large structures. For the rest of us, there is no change. We still live in earthquake country. We still need to work on our personal readiness. The largest events still will be rare. Better for Oaklanders to prepare for the smaller but still destructive magnitude-6 earthquakes, like the one in Napa last year. We will experience more than ten times as many of those, and they are worrisome enough. What I like about the new forecast is that it isn’t really a forecast. The system has grown in sophistication and flexibility to the point that it’s really a modeler’s sandbox, a software environment that can handle surprises, new information and complexities better than ever. Talk to a seismologist and they’ll instantly agree that earthquakes pretty much always take us by surprise. The giant Tohoku earthquake, which happened four years ago today, took seismologists by surprise. You name it, the quake was a surprise. It will be many decades, maybe centuries, before this state of affairs ends. This entry was posted on 11 March 2015 at 9:35 pm and is filed under Earthquakes. You can follow any responses to this entry through the RSS 2.0 feed. You can skip to the end and leave a response. Pinging is currently not allowed. 3.6% is still rather unlikely.. That 6.7m number is alarming though.. Based on how active the plates seem to be worldwide it wouldn’t surprise me to see one that big hit this year..